An Iran-140 Sepahan Air passenger plane bound for Tabas in northeast Iran with 48 passengers and crew on board crashed on a road near Tehran’s Mehrabad airport on Sunday, killing at least 38 people, Iranian state media reported. Initial reports said that all passengers and crew on board had been killed, but state media later reported that some passengers had been injured and transferred to hospital. Islamic Republic News Agency (IRNA) said that eight or nine had survived and quoted a doctor as saying that one of the injured had regained consciousness. State television said 38 people died instantly and 10 were injured and were transferred to hospital in critical condition. Iranian Student News Agency (ISNA) reported that five had been taken to hospital, but cited a doctor at Imam Hospital as saying they had died. The Civil Aviation Authority said the passengers included two infants and three children under the age of 12, IRNA reported. The pilot detected technical issues four minutes after takeoff and tried to return to the airport, state television said, but the twin-engine turboprop crashed on a road at 9.18 am local time. One eyewitness said the plane crashed into a wall. A photograph on IRNA’s website showed a huge plume of black smoke billowing over traffic standing at a road intersection. 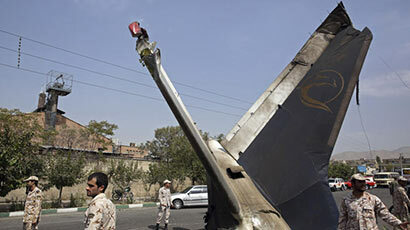 A photograph from the Iran Student News Agency showed a charred tailfin lying on the ground. The plane’s black box has yet to be found, the deputy minister of Roads and Urban Development said. Iran’s airlines have been plagued by crashes, which Iranian politicians blame on international sanctions that block the airlines from replacing their ageing fleets. About 14 crashes involving Iranian planes were reported in the decade to January 2011. For years, planes have been kept in service through parts imported on the black market, cannibalised from other planes or reproduced locally, aviation sources say. Iran’s four largest carriers – Iran Air, Iran Aseman Airlines, Mahan Air and Iran Air Tours – all have average fleet ages above 22 years, Iranian media have reported. They serve a market of 76 million people. U.S. companies Boeing Co and General Electric Co have said they are seeking to export parts to Iran under the agreement for sanctions relief. The chief of Iran Air said the airline will need at least 100 passenger jets once sanctions against the country are lifted. The plane that crashed – an Iran-140 – is a locally assembled version of the Antonov-140. Its safety record has come into question in the past. In December 2002, an Iran-140 test flight crashed, killing at least 46 people, including engineers who had helped design it. The government claimed human error caused the crash, but many expressed worries about the aircraft. More than a dozen large airlines and several fledgling carriers operate in Iran. The state carrier, Iran Air, has a fleet of about 40 planes including nine Boeing 747 jets, some of which were built before the Islamic Revolution in 1979. The safety record for the carriers has led to most Iranian flights being prevented from landing in the EU. Mehrabad is located in a western suburb of Tehran and mainly functions as a domestic airport, although it also serves some international routes.